Located about 20 kilometers south of Beaune and one of the major appellations of the Côte Chalonnaise, Rully has a long history of making sparkling wine. 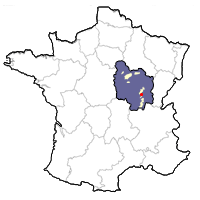 Les Frères Petiot, a négociant firm in Chalon-sur-Saône, initiated the production of sparkling wine in this part of Burgundy in the early 19th century. The firm's maître de chai, François-Bazile Hubert, went on to create his own négociant firm in Rully in 1830. Around this time, production of sparkling wine in Rully (then known as Champagne mousseux or Bourgogne mousseux) was 36,000 bottles. More than a century and a half later production has grown to nearly two million bottles. With a growing market for sparkling wines, loads of producers are making Crémant de Bourgogne nowadays. Many of them don't make it totally by themselves. After all, production of sparkling wine demands a certain amount of equipment and savoir-faire that is often outside the possession or knowledge of many small producers who focus on still wines.